I recently started playing Tera since it went free to play and I saw a sale on Newegg.com for the collector’s edition. The Logitech included profile is crap in my opinion. They do the same thing they always do and put the movement keys on both the keyboard and joystick. 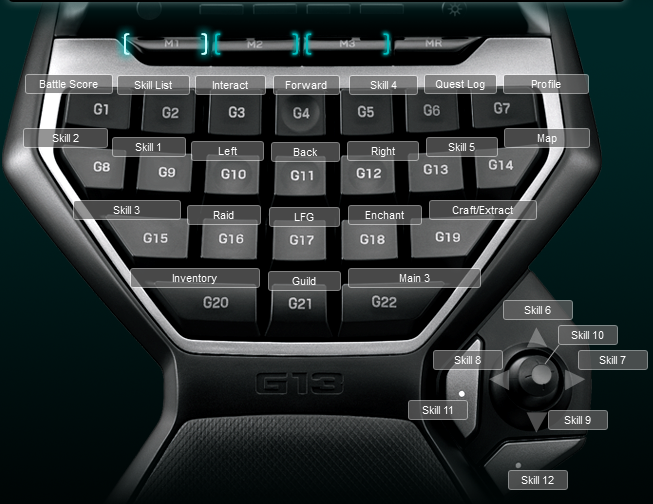 I created my own Tera Logitech G13 Profile that is actually useful. I mapped the jump and shift keys to my mouse side buttons. The placement of shift on the mouse allows me to access shift plus number key combos very easily. The issue with this is that shift plus number keys are not the default keyboard setup in Tera and Tera doesn’t save keyboard options across characters. This means I have to reconfigure the second bar to use shift plus a number key for every character I play. Below is a screenshot of the keyboard layout.